An impressive, traditional-style Spanish villa with a great sea view, Villa Playa Cristina is the ideal choice for a laid back villa holiday. The pool terrace, garden and sea-facing balcony provide the perfect relaxed setting. But, if you do decide to venture out, the beach and facilities of Playas de Fornells can be easily reached on foot in around 15 minutes. Air conditioning/heating in the bedrooms and WiFi are included. The sea view is definitely the highlight of this beautiful villa - the perfect choice for a relaxing break. Outside, Villa Playa Cristina has a partially shaded patio and a small artificial lawned garden surrounding the private swimming pool. There is plenty of space to relax in the sunshine. The patio extends around the side of the house to the balcony overlooking the sea at the front. The brick BBQ is by the dining area - ideal for a lazy alfresco meal in true Spanish style! The villa has a driveway and off-street parking area, with steps up to the main entrance at the front of the house. The living area is of a typical Spanish design, with a high-beamed ceiling, flat screen TV, lounge and dining area. A large window and patio door at the front of the house frame the superb sea view and the balcony is the perfect place to sit and enjoy the scenery with a morning coffee. The kitchen is fully equipped and also has a breakfast table. Villa Playa Cristina has a double bedroom with en suite bathroom. There is a children's twin bedroom that has patio doors leading to the pool terrace and a further twin bedroom. There is also also a separate shower room. Tourist Licence Registration: VT 609 ME. 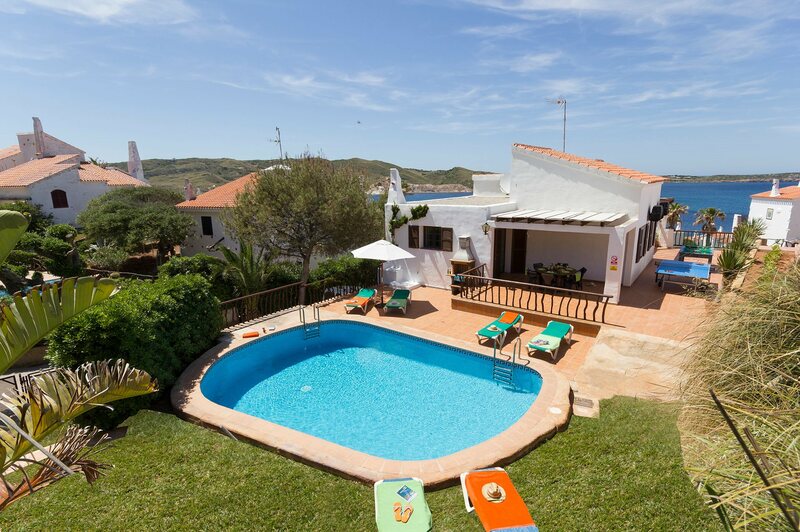 The small resort of Playas de Fornells is ideal for anyone wanting a relaxed, laid back villa holiday. Not to be confused with Fornells on the other side of the headland, Playas de Fornells has a picturesque sandy beach and a number of good shops and restaurants within a 15 minute walk of the villa. Or, for anyone who does decide to hire a car, a number of great attractions, alternative beaches and facilities can be reached within a short drive. The centre of Playas de Fornells is reachable in around 15 minutes on foot or a couple of minutes by car. Here you'll find a choice of small shops where you can pick up daily essentials. Playas de Fornells has a selection of good restaurants and cafes. The nearest beach is Cala Tirant, which is ¾ mile away on foot or 4½ miles by car. The beach is a good size with gold sand and shallow water. Although serious beach-lovers may prefer to venture to the neighbouring resort of Arenal den Castell, which has a huge, horse shoe-shaped bay surrounded by cafes and seafront restaurants. There is a small splash park in Playas de Fornells, but any of the islands more established waterparks can be reached in around 45 minutes by car. Or, 14 miles inland is the popular Lloc de Menorca Zoo which also makes a great family day out! The island has a number of attractions and places to visit for a great day trip. Playas de Fornells is conveniently situated right in the middle of the north coast making anywhere in Menorca very easy to reach by car. If you like seafood, Fornells is a must! This quaint fishing village has a number of excellent seafood restaurants serving fresh, locally caught fish. The towns of Ciutadella and Mahon are definitely worth a visit during your stay for a day spent browsing the chic boutiques and market stalls. Or why not venture up Monte Toro, the islands highest point? The views from the top are spectacular and there is also a good gift shop and café to sample before starting the journey back down the hill. Menorca's only golf course and driving range is around 15 minutes away by car. Playas de Fornells has some unusual gardens, ideal for a leisurely stroll through the resort. Alternatively, if you want something more active, the resort of Fornells is 10 minutes' drive around the coast. The area is well known for its water sports facilities, in particular windsurfing and sailing. Villa Playa Cristina is not available to book for season as it is sold out. Take a look here at the Menorca villas that are currently on sale.